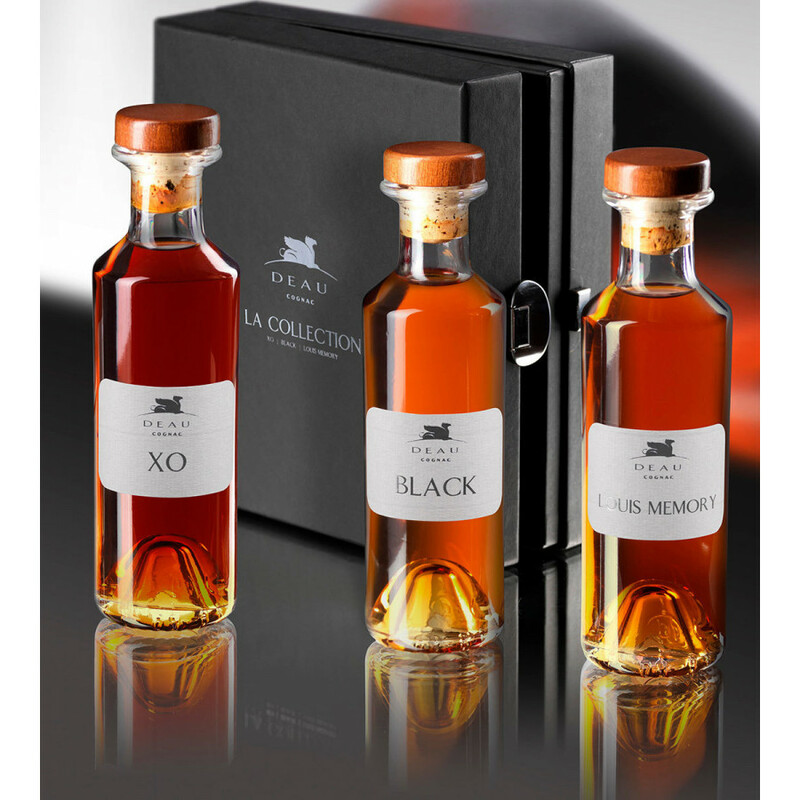 The Deau Tasting Set 3 Bottle Trilogy is the perfect set to compare the versatility of this Cognac producer. 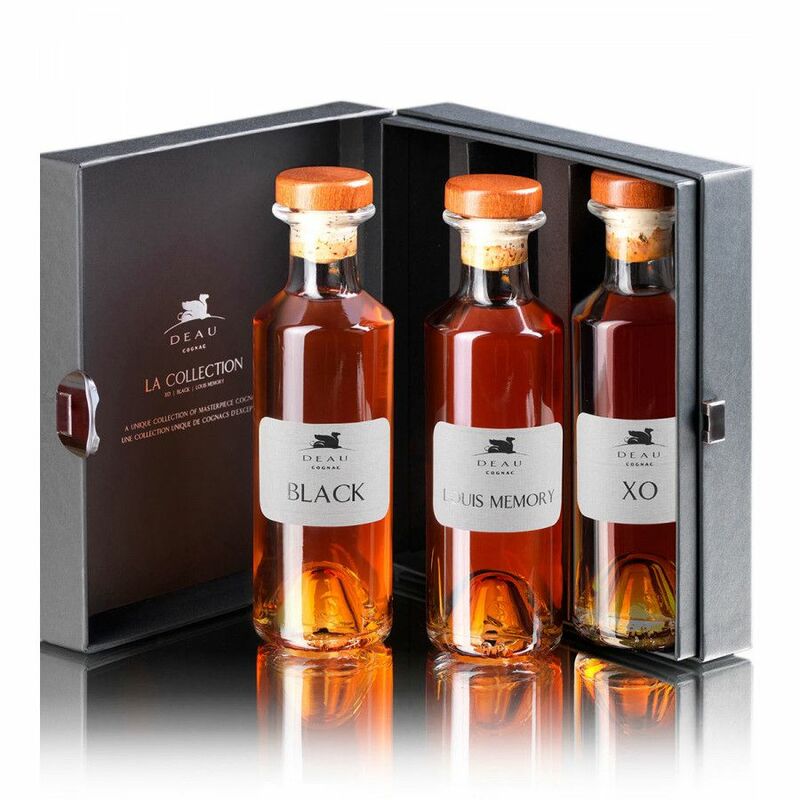 The set consists of three 200ml size bottles of an XO, Extra and Hors d'Age quality. It's a wonderful way to test your taste buds and understand the nuances between the different qualities. Such a set is also a great way to try out Deau's range if it's new to you. And, of course, such a set would be really well received by any Cognac lover or connoiseur of fine liquor. A blend of both Petite Champagne and Fins Bois eaux-de-vie, this is an intense, cheeky XO Cognac that truly takes one on a sensory journey. Aged for over a decade, it first delights with it's deep amber color. On the nose it teases with both fruity and floral scents. The palate continues the ride, with delicate touches of dried plums, wild peach, jasmine, and oak wood. 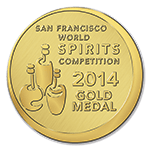 And naturally, the finish is as long and satisfying as one would expect from a Cognac of this quality. No, the Cognac isn't black - but the bottle is! Deau Black is an XO quality created from a blend of Fine Champagne eaux-de-vie. 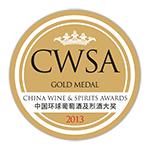 It's beautiful in all respects, from its deep golden hue right though to the lengthy finish, it thrills with floral notes and incredibly smooth aromas of well-preserved fruit. The house of Deau are deservedly very proud of this, their flagship product. 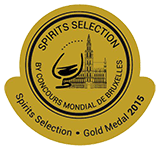 Hors d'Age in quality, it's a pure Grande Champagne Cognac, with the olest component being from the harvest of 1916! The aromas and flavors are many, yet they marry together perfectly. We detected peach, cinnamon, black cardamom, cinnamon... And, naturally, the wonderful rancio that only appears in a truly well aged Cognac. In a word - delicious!